It took us a while to try SUNdeVICH. I don't know why. I'll blame it on a complete lack of ability to get out of our house, or at the very best our neighborhood, during the weekends. It's not like I was ever confused. I always knew it was going to be good, I guess I just didn't know how good. 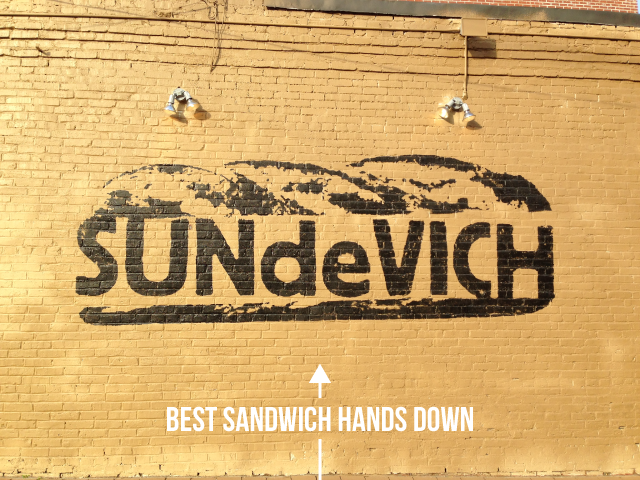 Turns out we had one of the best sandwich experiences EVER. We got a Seoul and a Havanna along with some spicy cole slaw and brined veggies. Also, Sprecher Root Beer. It was delicious, I'd like to go back now please. Hi! Found you through the dc Internets... If one were to set out on a food hop (similar to a bar hop) in the Waterfront/Cap Hill/Union Station area, what food places would you rec'd? I love the ones you posted about so far, so I'm curious where you would go!